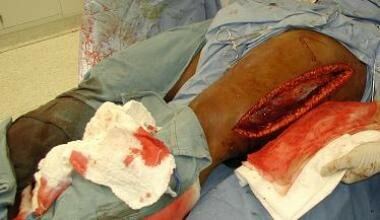 Fasciotomy is a clinical procedure indicated once the clinical diagnosis of compartment syndrome is made. This article focuses on the treatment of acute compartment syndrome. A fasciotomy consists of one or more fascial incisions and remains the only effective way to treat acute compartment syndrome. Diagnosis of compartment syndrome can be made by clinical examination or with more objective measures such as compartment pressures. Although absolute compartmental pressures are often used for fasciotomy decision making, the difference between the compartment pressure and diastolic pressure (Δ p), has been associated with an increased accuracy in diagnosing compartment syndrome and is particularly useful in the multitrauma patient. Multitrauma patients can become hypotensive and therefore create an environment in which the development of compartment syndrome can occur at lower pressures and confound diagnosis of compartment syndrome in these clinical scenarios. A high clinical suspicion for compartment syndrome along with serial examinations without the use of compartment pressure measurements is still used in many settings today. Certainly, all of these signs do not need to be and are often not present in the setting of acute compartment syndrome. A pulseless extremity more likely reflects large vessel injury as a very late finding in compartment syndrome and may not develop at all despite protracted elevated pressures. In a patient who cannot express pain or paresthesias, serial clinical examinations along with monitoring of compartment pressure can play a more important role in the diagnosis. Myonecrosis. Excised muscle from a patient with a femur fracture and compartment syndrome of the leg that was released more than 10 hours from onset. Patient went on to an above-the-knee amputation. Many factors play a role in the development of compartment syndrome, including vascular injuries, soft tissue trauma, and systemic hypotension in the patient with a traumatized extremity. Most commonly, acute compartment syndrome is secondary to trauma such as fracture, arterial injury, physical compression, or burn. However, postoperative hematoma, tight-fitting casts, and infiltration of fluids through an intravenous catheter, as well as a multitude of other issues, have also been described in association with compartment syndrome (see the image below). Rhabdomyolysis: 31-year-old dehydrated and overweight female with sickle cell trait presented with bilateral thigh and leg compartment syndrome after military physical training (PT) test. Interstitial pressures increase within a compartment, and, as it reaches and exceeds venous pressure, venous outflow is halted, causing further increase in intracompartmental pressures. This results in a shunting of blood flow away from the injury and toward areas of lower vascular resistance. In this environment, muscle cells are unable to adapt to the decreased oxygen tension that is secondary to the increased tissue pressures. This cycle propagates itself and cell death–induced metabolic changes contribute to the hypoxia, further increasing pressure. Knowing the pressure at which this cycle is initiated has been the goal of many studies, and although no incontrovertible value has been identified, compartmental pressures measuring 30 mm Hg or more are understood to often require surgical intervention (see the image below). 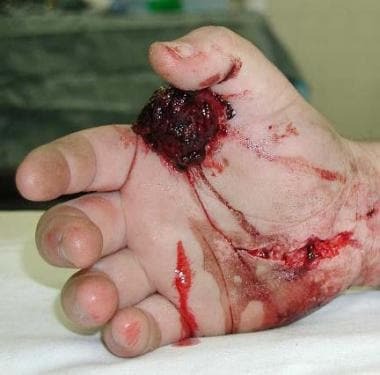 Crush injury to the hand created pressures high enough to result in muscle extrusion from the adductor compartment and tearing of the skin over the palm. Anesthesia decision making differs based on the situation in which the compartment syndrome and fasciotomy occur. General anesthesia is often performed when the situation allows. The patient is positioned supine, with a bump under the affected hip. Two longitudinal 15- to 20-cm incisions are made. The anterolateral incision is used to decompress the anterior and lateral compartments. The posteromedial incision is used to decompress the superficial posterior and deep posterior compartments. An anterolateral incision is demonstrated in the image below. (2) Perform subcutaneous dissection to expose the fascia overlying the anterior and lateral compartments. (3) Identify the intermuscular septum between the anterior and lateral compartments. A posteromedial incision is demonstrated in the image below. 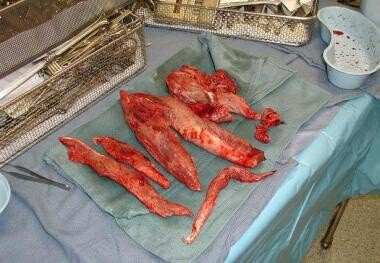 Fasciotomy 10 hours from onset of compartment syndrome secondary to femur fracture. Notice the blister denoted by arrow. Patient later had an above-knee amputation secondary to myonecrosis from prolonged ischemia. (1) Begin the lateral incision at the head of the fibula and extend it distally along the path of the fibula to the ankle, followed by subcutaneous dissection. (2) Identify the intermuscular septum between the anterior and lateral compartments, being mindful to protect the superficial peroneal nerve in this territory. (3) Beginning 1 cm anterior to the intermuscular septum, release the anterior compartment. (4) Beginning 1 cm posterior to the septum, release the lateral compartment. (5) Identify the superficial posterior compartment and perform a fasciotomy of the superficial posterior compartment over the gastrocnemius-soleus complex. (6) Retract the lateral compartment anteriorly and the superficial peroneal compartment posteriorly to expose the deep posterior compartment. (7) Identify the interosseous membrane at the posterior aspect of the fibula and release the deep posterior compartment from this tissue. Two incisions are used if both volar and dorsal compartment releases are required. The volar incision is used to decompress the volar and mobile wad compartments. The dorsal incision is used to decompress the dorsal compartment. Compartment syndrome of the forearm of an anticoagulated patient after the radial artery was punctured while obtaining an arterial blood gas. 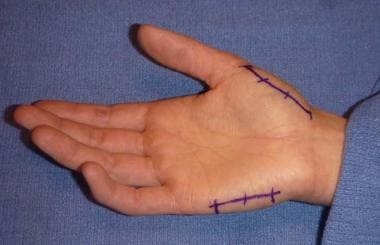 The S-type incision includes carpal tunnel release. The distal landmark is the distal extent of the carpal tunnel. The proximal landmark is the ulnar side of the elbow flexion crease. 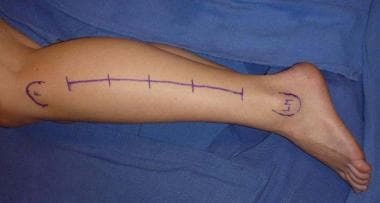 The S-shaped forearm incision begins and ends along the ulnar border of forearm and is located along the radial border of mid forearm. (2) Perform subcutaneous dissection to expose the fascia overlying the mobile wad and superficial forearm muscles. (3) Proximally, identify and divide the lacertus fibrosis; protect the underlying brachial artery and median nerve. (4) Longitudinally incise the fascia overlying the flexor carpi ulnaris. (5) Expose the deep compartment of the forearm by the retracting flexor carpi ulnaris ulnarly and the flexor digitorum superficialis laterally. (6) Longitudinally incise the fascia overlying the deep muscles of the forearm. (7) Identify and release the fascia overlying the mobile wad; this includes the brachioradialis and wrist extensors. (9) Assess dorsal compartments to determine if a fasciotomy needed. 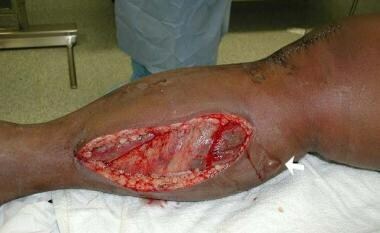 Forearm after compartment release. Median nerve denoted by star. The dorsal approach for release of dorsal compartments is demonstrated in the image below. The proximal landmark for incision is approximately 2 cm distal to the lateral epicondyle. The distal landmark is the middle of the wrist. 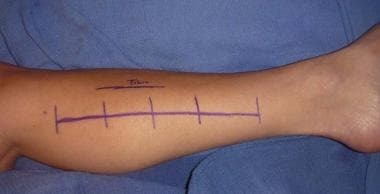 (1) Make an approximately 10 cm longitudinal skin incision. (2) Perform subcutaneous dissection to expose the fascia overlying the dorsal compartment. (3) Longitudinally incise the fascia overlying the extensor digitorum communis muscle. (4) Identify and dissect the interval between the extensor digitorum communis and the extensor carpi radialis muscles to access the deep fascia. (5) Incise the deep fascia longitudinally over the deep dorsal compartment muscles. Four incisions are used, two dorsal and two volar, as shown in the images below. 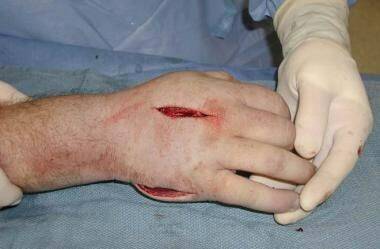 Volar incisions are used to decompress the thenar and hypothenar compartments. Dorsal incisions are used to decompress the interosseus compartments and the thumb adductor compartment. Locations for dorsal incisions over second and fourth metacarpals. Provides access to the dorsal and volar interosseous compartments and adductor compartment to the thumb. Locations for thenar incision over radial aspect of the thumb metacarpal and mark for the hypothenar incision over ulnar aspect of the fifth metacarpal. (1) Two separate longitudinal incisions are made, over the thenar and hypothenar compartments. 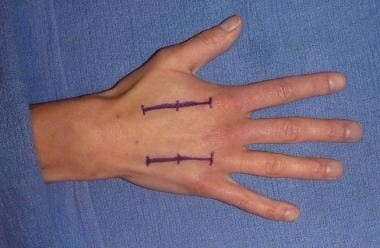 (1) Two separate longitudinal skin incisions are made, centered over the second and fourth metacarpals. (2) Dissection proceeds along the radial and ulnar borders of the both the second and fourth metacarpals to the level of the dorsal interossei fascia. (3) Incise the fascia of all four dorsal interosseus muscles. (4) Continue blunt dissection along the ulnar side of the second metacarpal to decompress the first volar interosseus and adductor pollicis muscles. (5) Continue blunt dissection along the radial side of the fourth and fifth metacarpals to decompress the second and third volar interosseus muscles, respectively. Crush injury from Image 3: status post-compartment release. Traumatic tear provided access to the thenar volar interosseous compartments. Single dorsal incision was made to gain access to the dorsal interosseous compartments, and hypothenar incision to gain access to the hypothenar compartment. 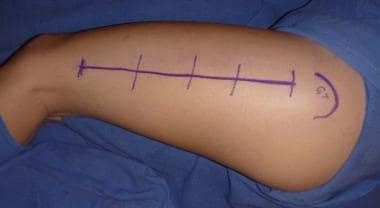 Typically, only one incision is used, located over the lateral thigh, as shown in the image below. The lateral incision is used to decompress the anterior and posterior compartments. A second incision, located over the medial thigh, is used if medial compartment release is required. Location for thigh incision beginning just distal to the intertrochanteric line. (2) Perform subcutaneous dissection to expose the iliotibial band. (3) Longitudinally incise the iliotibial band along the entire length of the skin incision. (4) Identify and longitudinally incise the fascia overlying the vastus lateralis. (5) Dissect the vastus lateralis off the lateral intermuscular septum and coagulate all perforators. (6) Make a 1- to 2-cm incision in the lateral intermuscular septum, and longitudinally extend it, typically using Metzenbaum scissors, along the entire length of skin incision. The anterior and posterior compartments have now been released. (1) Make an approximately 20 cm longitudinal skin incision along the anteromedial thigh, centered over the adductor muscles. 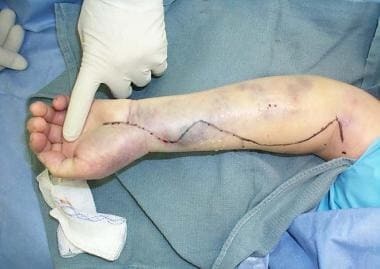 (2) Perform subcutaneous dissection to expose the fascia overlying the medial compartment. (3) Longitudinally incise the fascia along the entire length of the skin incision. (4) Incise and release the medial intermuscular septum, if warranted. Location of medial foot incision from just below the medial malleolus to the proximal aspect of the first metatarsal. Location of dorsal incisions: one between the second and third metatarsals and one between third and fourth metatarsals. (1) Make a medial foot incision extending from just below the medial malleolus to the proximal aspect of the first metatarsal. (2) Release the fascia overlying the abductor hallucis and flexor digitorum brevis. (3) Incise and release the medial intermuscular septum longitudinally. (4) Bluntly dissect and release the central, lateral, and intrinsic compartments. (5) Make two longitudinal dorsal incisions, one between the second and third metatarsal and the other between the third and fourth metatarsals. (6) Divide the superficial fascia and elevate the interosseous muscles off the metatarsals to further decompress the compartments. (7) Leave the wound open. Apply a large, bulky dressing or wound vacuum-assisted closure device. Elevate the affected extremity for 24-48 hours after surgery. If necrotic muscle develops, return to the operating room for excision of necrotic muscle. Perform dressing changes at the bedside or in the operating room, as deemed appropriate per the clinical situation. Perform delayed primary skin closure when swelling subsides. If delayed primary skin closure cannot be performed within 5 days, perform split-thickness skin grafting. Perform standard suture or staple removal and postoperative wound checks. Negative-pressure wound therapy (wound V.A.C.) may be used instead of a bulky dressing. 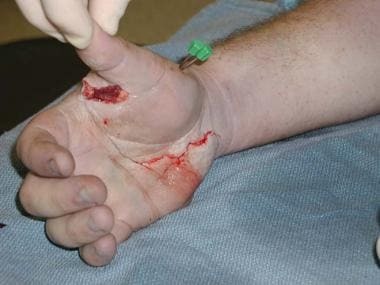 Many techniques have been described to facilitate primary closure of fasciotomy sites, including placing vascular loops in a zigzagged fashion across the fasciotomy site. This may help to slowly close the wound by gradually tensioning the incision with the vessel loops. Campbell WC, Canale ST, Beaty JH. Campbell's Operative Orthopaedics. Philadelphia, Pa: Mosby/Elsevier; 2008. 2737-743. Tintinalli JE, Stapczynski JS. Tintinalli's Emergency Medicine: a Comprehensive Study Guide. New York, NY: McGraw-Hill; 2011. Chapter 8. Kim TH, Chung JY, Kim KS, Song HK. Is external fixation needed for the treatment of tibial fractures with acute compartment syndrome?. Injury. 2017 Nov 16. [Medline]. Konda SR, Kester BS, Fisher N, Behery OA, Crespo AM, Egol KA. Acute Compartment Syndrome of the Leg. J Orthop Trauma. 2017 Aug. 31 Suppl 3:S17-S18. [Medline]. Winkes MB, Hoogeveen AR, Scheltinga MR. Is surgery effective for deep posterior compartment syndrome of the leg? A systematic review. Br J Sports Med. 2013 Sep 24. [Medline]. Browner BD. Skeletal Trauma. Philadelphia, Pa: Saunders Elsevier; 2009. Chapters 12,13, 48. Gamulin A, Lübbeke A, Belinga P, Hoffmeyer P, Perneger TV, Zingg M, et al. Clinical and radiographic predictors of acute compartment syndrome in the treatment of tibial plateau fractures: a retrospective cohort study. BMC Musculoskelet Disord. 2017 Jul 18. 18 (1):307. [Medline]. Masquelet AC. Acute compartment syndrome of the leg: pressure measurement and fasciotomy. Orthop Traumatol Surg Res. 2010 Dec. 96 (8):913-7. [Medline]. Arató E, Kürthy M, Sínay L, Kasza G, Menyhei G, Masoud S, et al. Pathology and diagnostic options of lower limb compartment syndrome. Clin Hemorheol Microcirc. 2009. 41 (1):1-8. [Medline]. Traub BC, Lane MK, Traub JA. Exercise-Induced Acute Bilateral Upper-Arm Compartment Syndrome. Case Rep Emerg Med. 2017. 2017:9454782. [Medline]. Harrison E, Tan W, Mills N, Karantana A, Sprange K, Duley L, et al. A feasibility study investigating the acceptability and design of a multicentre randomised controlled trial of needle fasciotomy versus limited fasciectomy for the treatment of Dupuytren's contractures of the fingers (HAND-1): study protocol for a randomised controlled trial. Trials. 2017 Aug 25. 18 (1):392. [Medline]. Gatenby G, Haysom S, Twaddle B, Walsh S. Functional Outcomes After the Surgical Management of Isolated Anterolateral Leg Chronic Exertional Compartment Syndrome. Orthop J Sports Med. 2017 Nov. 5 (11):2325967117737020. [Medline]. Doherty GM. Current Diagnosis & Treatment: Surgery. New York, NY: Lange Medical /McGraw-Hill; 2010.